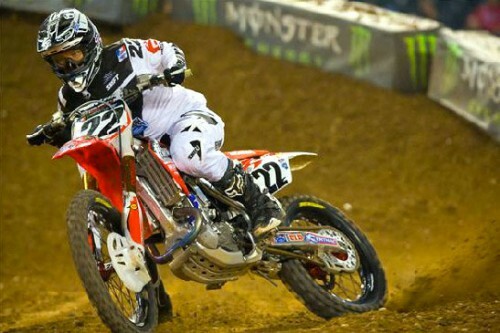 Chad Reed won his first race of the 2012 AMA Supercross season in Los Angeles but the victory was overshadowed by a first-lap collision that left Trey Canard and Ryan Morais with broken backs. Racing for Team Honda Muscle Milk, Canard was injured on the first lap after catching a piece of some signage. That forced him to single a triple jump, putting him in the path of Star Valli Yamaha rider Ryan Morais who landed on Canard from behind. 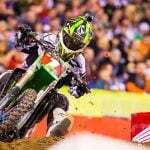 Canard was reportedly knocked out in the collision and suffered three vertebrae fractures, a collapsed lung, broken ribs, broken jaw and a concussion. Canard also reportedly has full feeling in his legs. Morais suffered a broken jaw, several fractured vertebrae and some broken ribs, but no sign of spinal cord damage. The crash brought out a red flag and the race was restarted. Monster Energy Kawasaki‘s Jake Weimer seized the holeshot after the second shot and led for the first five laps. He was passed on lap six however, by Reed on his TwoTwo Motorsports Honda. On the ensuing lap JGRMX Yamaha’s James Stewart aggressively passed Weimer who meanwhile crashed and dropped back several positions. 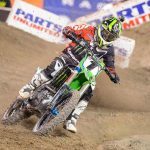 Moving up to third place was Red Bull KTM rider Ryan Dungey who entered L.A. with a share of the series lead with Monster Energy Kawasaki’s Ryan Villopoto. Dungey tailed Stewart for a couple of laps until Stewart crashed on lap 12. 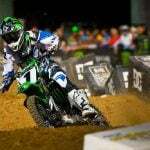 He was able to remount in third place and had to hold off Villopoto for the final podium spot. 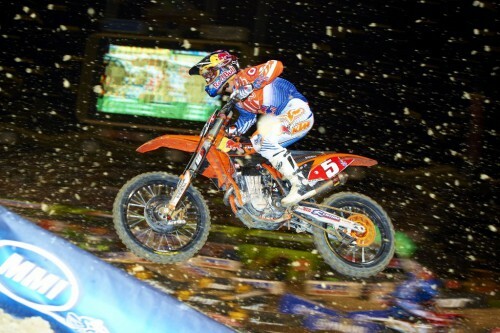 After 20 laps, it was Reed taking the win with Dungey just under three seconds behind. Stewart held onto third while Villopoto scraped his way into fourth from 17th position after running off-track at the restart. With his third podium position in as many rounds, Dungey takes sole position of first place with 67 points. 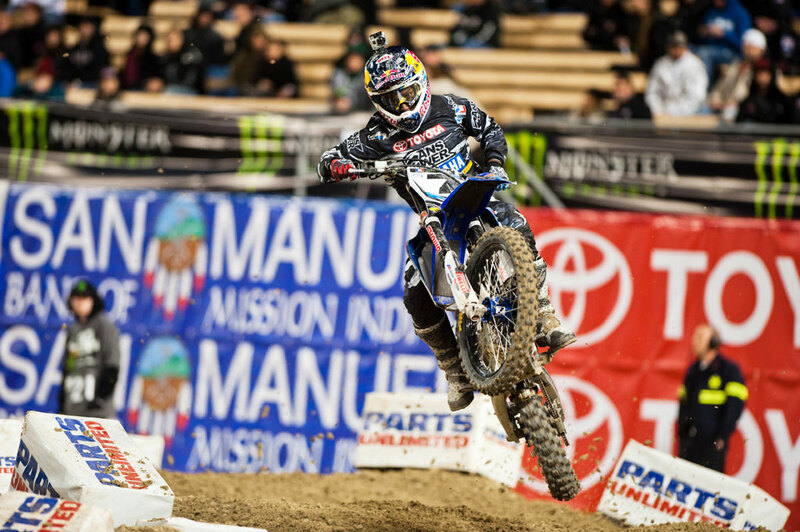 The Los Angeles win puts Reed into a tie for second with Villopoto at 63 points. Despite dropping down to 11th after leading in Dodger Stadium, Weimer is still in the mix in fourth place overall, tied at 48 points with Stewart. The 2012 AMA Supercross season now moves up the coast to Oakland for round four at Overstock.com Stadium.